^ Attenborough, David (1960). People of Paradise. New York: Harper & Brothers. ^ Worsley, Peter (1957). The Trumpet Shall Sound: A Study of 'Cargo' Cults in Melanesia London: MacGibbon & Kee. p. 154. ^ Worsley, The Trumpet Shall Sound, pp. 153–9. 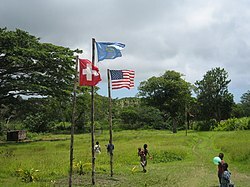 ^ Tabani, Marc, Une pirogue pour le Paradis : le culte de John Frum à Tanna (Vanuatu). Paris : Editions de la Maison des Sciences de l'Homme, 2008. ^ Geoffrey Hurd et al., Human Societies: An Introduction to Sociology (Boston: Routledge, 1986) p. 74. ^ Peter Worsley, From Primitives to Zen, Mircea Eliade ed. (New York: Harper & Row, 1977) p. 415. Rice, Edward (1974). 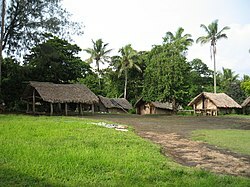 John Frum He Come : Cargo Cults & Cargo Messiahs in the South Pacific. Garden City: Dorrance & Co. ISBN 0-385-00523-7. Jarvie, I. C. (1964). The Revolution in Anthropology (reprinted 1967) pp. 61–63. London: Routledge & Kegan Paul. Lindstrom, L. (1990) “Big Men as Ancestors: Inspirations and Copyrights on Tanna (Vanuatu)”. Ethnology, vol xxix no. 4. October. Nat. Geographic: May 1974. 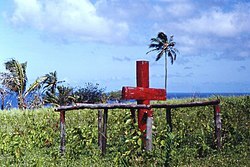 "Tanna (Island, New Hebrides, South Pacific Ocean) Awaits the Coming of John Frum (cargo cults of Melanesia since about 1940)". Raffaele, Paul (February 2006). “In John They Trust”. Smithsonian (Smithsonian). http://www.smithsonianmag.com/people-places/john.html 2009年11月26日閲覧。.